Leverate recently announced the integration of the Autochartist service to their new Activ8 trading platform. Activ8 comes with tools that will appeal to traders of all experience levels, all housed in one platform. This integration allows Autochartist content to be used directly by sales, marketing and retention teams in order to engage with customers in a more meaningful manner. This type of integrated content solution is of massive benefit to Activ8 brokers and will give Leverate’s broker customers a unique edge over competitive platforms. Activ8 users will have access to Autochartist’s trading opportunities including Chart and Fibonacci Patterns, as well as Key Levels. In addition, Autochartist is integrated with the Activ8 CRM system which allows for both improved user experience and automatic transfer of trader information to sales and retention teams. Traders will not need to leave the trading platform, open other browsers, or run applications or third-party set-ups as Autochartist’s technical setups can be found in the news section making analysis of trades quicker and easier. It’s clear that this integration fulfills both Autochartist and Leverate’s primary goals which are to develop technology that optimizes processes for brokers and their clients. With this partnership clients are presented with valuable trading opportunities and are able to execute trades from one place. A functionality which will see increased broker productivity and profitability. Autochartist was established in 2004 and is currently servicing hundreds of the largest and most successful on-line brokers and institutions. 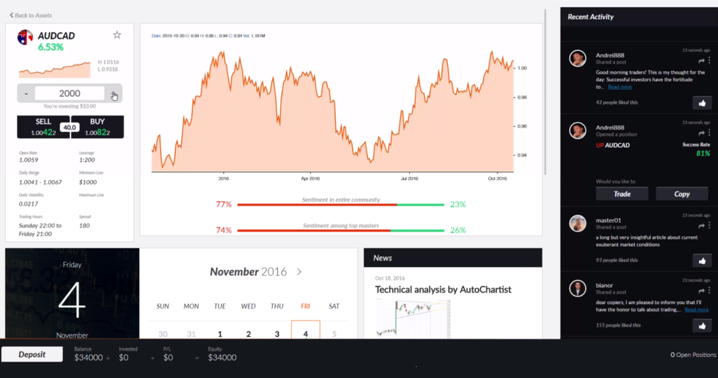 With a community of more than 250,000 traders in over 80 countries worldwide receiving well over 400 000 potential trade opportunities each month Autochartist has proven itself as the leading chart pattern recognition solution for Brokers, Market Makers and Educational Institutions. Autochartist has established itself as a valuable trading tool for all traders and has still not been matched in terms of speed, accuracy, and information quality. Through a process of continuous improvement, our product has been enhanced and iteratively refined.